We use only natural roses, grown and selected at the height of their individual beauty. We preserve them in their splendour forever by dipping them in the finest 24 karat gold, silver or platinum, or having them gold-trimmed and glazed. 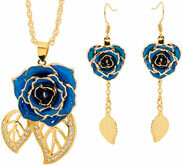 We also gold-trim and glaze jewellery fashioned from rose petals. 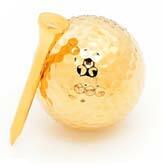 The Eternity Rose offers unrivalled guarantees due to its high quality merchandise. 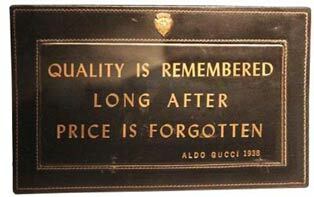 Each product is manufactured to the most exacting specifications and standards. 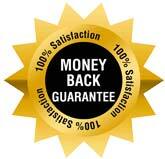 We aim to provide priority shipping within one working day of placing your order at no extra cost. We understand the importance of your gift arriving on schedule, so in most cases, you will receive your order within 2 to 3 business days upon shipment. We provide a full tracking service to advise where your parcel is. Unfortunately our carrier is unable to deliver to PO boxes. 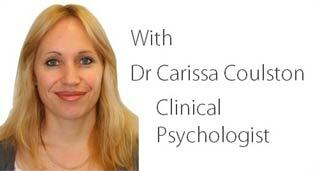 Every woman wants to feel special, and now there is the perfect way to endorse just how important she is in your life. 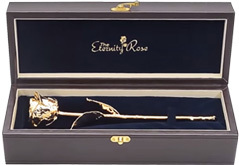 A romantic gift from The Eternity Rose is ideal for demonstrating the full extent of your affection and devotion for the woman in your life and will express, without any doubt, your intentions towards your beloved. Choosing a romantic present is a wonderful way to show respect and admiration for your special lady, and she will know that your feelings for her are serious. What could be more symbolic and iconic than a single rose? In art, literature and history through the ages, there has been no better token to represent romance, blossoming love and true beauty. Embodying the message of promised love and passion, the single rose conveys devotion. Imagine then, the adoration that can be expressed when you give a single gorgeous rose blossom eternally preserved at the peak of its perfection. 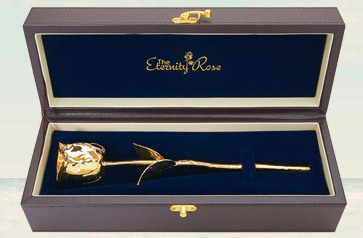 Whether you choose a stunning rose dipped in either gold, silver or platinum, or a colourful bloom that has been perfectly trimmed in the purest 24 karat gold and glazed, there is sure to be an Eternity Rose that is ideally suited to the taste and sense of style of your significant other. While a real rose is a gift to be cherished, an Eternity Rose is significantly more. An enduring testament to your love and adoration, it signifies your hope for a long-lasting future together and conveys your truest inner sentiments. 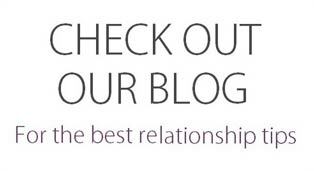 Throughout your journey as a couple, you have no doubt presented many tokens of love to your partner, yet were many of those gifts truly memorable? Are any of those gifts still on display in the home today as a cherished memento of happy times in your life together? 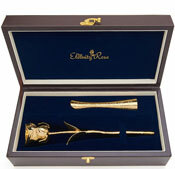 The time is now to present your love with a gift that will be remembered forever, so whether you are seeking out the perfect birthday present, a romantic Valentine's token, a graduation gift, Christmas trinket, or something special to mark the occasion of your anniversary, The Eternity Rose can provide the ideal solution. 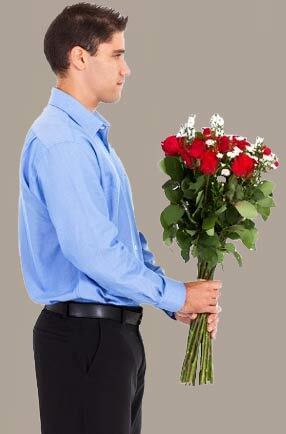 Although most ladies love to receive the gift of flowers, sadly within a short space of time they wither and fade. To mark an important event or commemorate a special occasion, you want to choose a floral gift that will endure an entire lifetime and call you to mind whenever it is seen. An Eternity Rose will form a lasting impression of your devotion, and will attract the attention and admiration of all who see it. Which woman does not love fine jewellery? Now you can combine the splendour of flowers and jewellery when you select a pendant or pair of earrings from The Eternity Rose's beautiful range. In a range of colours and styles, or even as a matching set, every single item has been produced from true miniature rose petals, preserved in an intricate glaze, and trimmed in fine 24 karat gold. 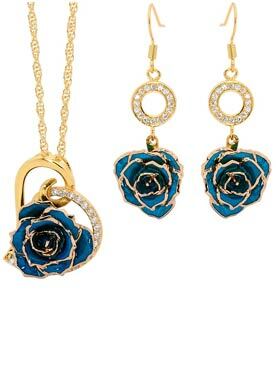 For a partner who has a true appreciation for the finest things that life has to offer, a spectacular gift set which includes a pendant and pair of earrings together with a stunning gold-dipped or glazed rose presented in a prestigious leather display case, is a present that will both inspire and dazzle the recipient. She will value such a magnificent token of love forever. While other competitors try to emulate the exquisiteness of The Eternity Rose, they can only fall short of the genuine article. Over nine years of development and honing our techniques, we have achieved perfection with our products, and we have reached a standard that others simply cannot match. Our roses are attractively priced, especially when consideration is paid to the high quality and excellent workmanship involved. Our roses are propagated in our own nurseries, tended by our own skilled horticulturists who have the necessary experience to be able to select only the very best and most pleasing flowers. When they have reached their ideal stage of growth, they are hand-picked and subjected to a long and complex preservation process which results in a blossom that will never tarnish or deteriorate over time. 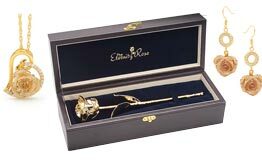 There is no occasion which cannot be celebrated by giving an Eternity Rose, and you can rest assured that the recipient will always be delighted and awestruck to receive such a brilliant gift. There is not a better gift to present to the love of your life on the occasion of your anniversary, and whether you have been married for half a century or one year, an Eternity Rose expresses the value you hold for your relationship, and your desire for a future of happiness. Help your loved ones to celebrate the key milestones in their marriage by surprising them with a beautiful Eternity Rose. 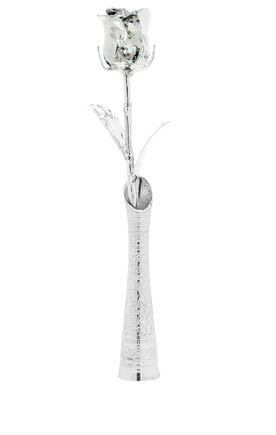 A silver-dipped rose is ideal for parents or close relatives who are celebrating 25 years of marriage as it ideally embodies the sentiments of the silver wedding anniversary; and a pure 24 karat gold-dipped rose is perfect for couples who have been married for 50 years and are commemorating their golden wedding anniversary. 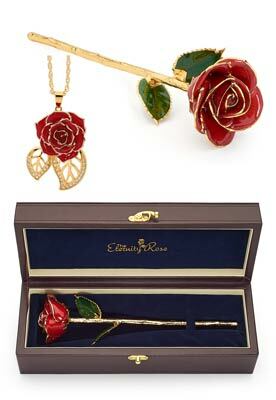 The Eternity Rose also produces roses to mark other anniversaries that are linked to a specific colour. The second anniversary, for example, is traditionally associated with the colour red, while the sixth wedding anniversary is customarily associated with purple. Buy your partner a different colour Eternity Rose every anniversary year until she has a gorgeous, vibrant bouquet that reflects your enduring passion for her. An anniversary present should be a memento that is treasured and takes pride of place in the happy couple's home. Symbolising the pair's love for each other through the ups and downs of married life, and representing hope for a long and happy future, every Eternity Rose comes complete with a beautiful leather display case so that it can be conveniently and impressively displayed in any room of the home. What better gift can you find to represent timeless beauty and effortless elegance? The ultimate craftsmanship which goes into producing each individual Eternity Rose ensures that precious metals and flowers come together in one beautiful expression of affection and esteem. Demonstrate your love for your partner by surprising her with a gift from The Eternity Rose today.